When one thinks of Jean-Michel Basquiat one tends to think of his apparently celebrity lifestyle, including his infamous friendship with Andy Warhol, plus his legacy of fantastic and vibrant paintings. 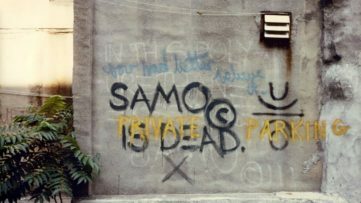 But it should be noted that the Basquiat art we know and love started out life on the streets in the form of the SAMO graffiti tag and slogans written as street art, of which you can read more in 20th Century & the Rise of Graffiti and Street Art and Music: Who Likes What? While it is common in the contemporary art scene for street artists to successfully combine street art and studio based work, Jean-Michel Basquiat is one of the most spectacular examples of the crossover from street art into the world of fine art. 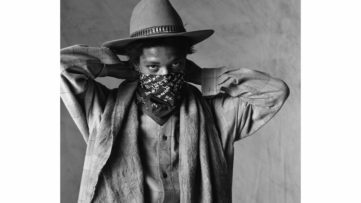 Since his tragic death at the age of 27 in 1988 from a heroin overdose, which you can read more about in Loving Basquiat, the desire for Basquiat art has never diminished, if anything his work is ever more collectable, regularly fetching high prices at auction. Evidence of this can be seen in our 10 Highest Sales at Major Auction Houses for the period January to April 2015, which includes two pieces of Basquiat art. When looking at Basquiat art it is clear that Jean-Michel Basquiat had a true and unique talent, beginning life as a street artist and then taking that energy and spirit into his studio work while addressing many social issues. 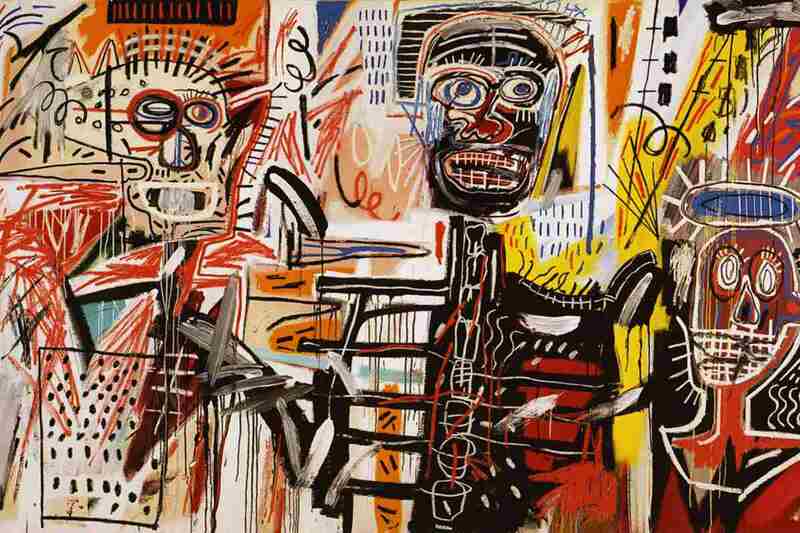 This article picks out ten examples of Basquiat art for you to enjoy and discuss. This example of Basquiat art is 50 cent Piece and was produced as part of The Daros Suite of Thirty-Two Drawings. Jean-Michel Basquiat was known for not making sketches for his paintings, so these thirty two drawings are all considered as individual pieces of Basquiat art. The artworks, including 50 cent Piece, show the artist working on ideas, making dense patterns of unconnected images and texts that come from science, commercial, history and popular culture sources. It is thought that Jean-Michel Basquiat deliberately created confusing images in order to keep the attention of viewers. Ascent is another example of the Basquiat art that appeared in the stunning Daros Suite of Thirty-Two Drawings that were acquired from Basquiat as a single group and give a tremendous insight into the unique creative process of Jean-Michel Basquiat. 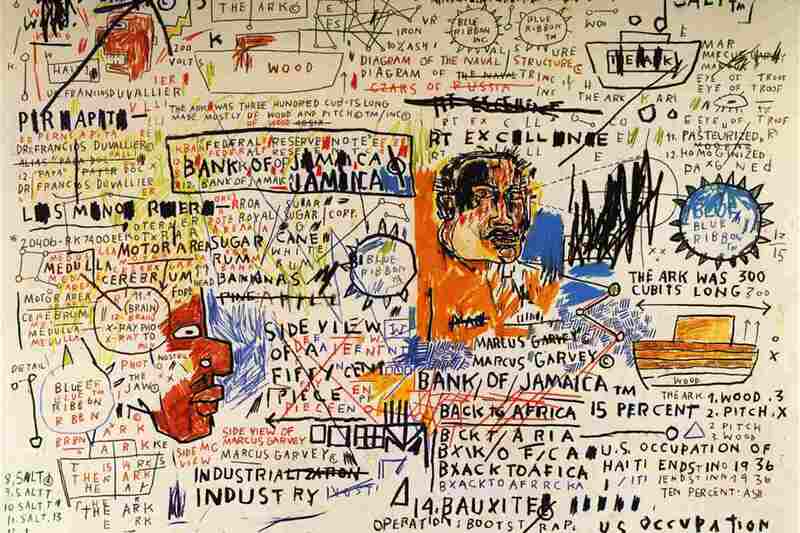 The wonderful collection of artworks reveal the street art influences that can be found in Basquiat art, the partially painted background as if it was part of a wall that has had graffiti added to it, creating a random collection of text and images. Read more about his techniques in Basquiat: The Unknown Notebooks. Bird on Money is an excellent example of Basquiat art in which the street art legend paid tribute to one of his heroes, jazz musician Charlie Parker. The beautiful loose style portrays Charlie Parker as a yardbird or chicken, a nickname that Parker was commonly known as, while the words Para Morir translate as ‘To Die’. Green Wood is painted above a cemetery, the area that Jean-Michel Basquiat was born and the cemetery in which he was later laid to rest. 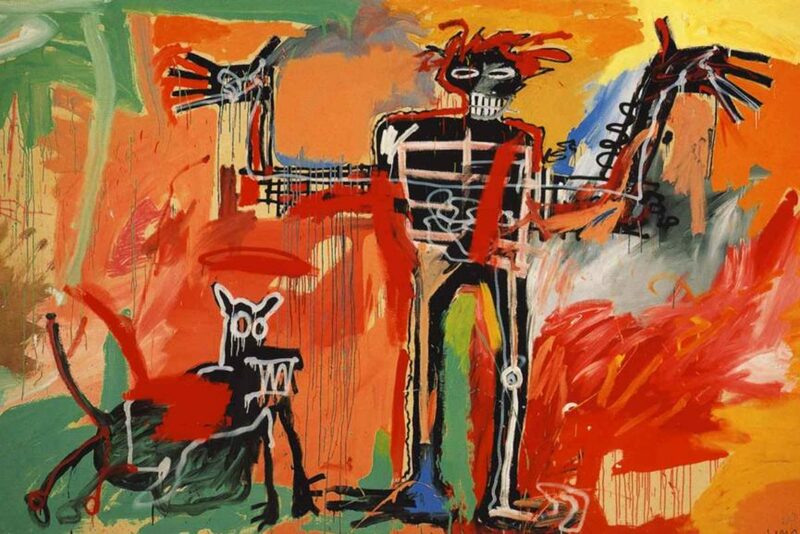 It is also thought Basquiat was trying to achieve a jazz like arrangement of his imagery in this painting. Read more in Street Art and Music: Who Likes What? Boy and a Dog in a Johnnypump is often quoted as Basquiat art at its zenith, painted with the wild energy of a primitive piece of art. The simple but stunning composition features just a boy, possibly Jean-Michel Basquiat representing himself in the form of a self-portrait, playing with a dog in a johnnypump. A johnnypump is a slang term for a fire hydrant that is open in the summer with kids playing in the water and was a common term in New York, particularly lower Manhattan and Brooklyn. 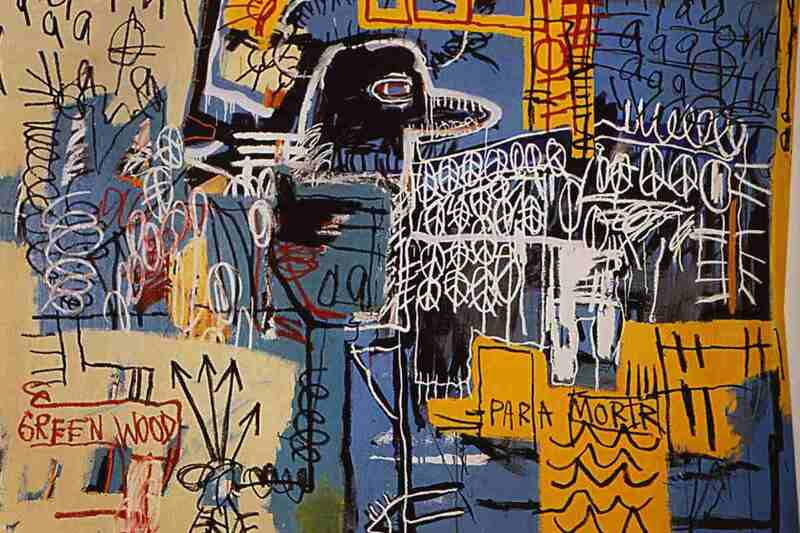 Read more about Jean-Michel Basquiat in 80’s Kings: Basquiat, Haring & Futura. 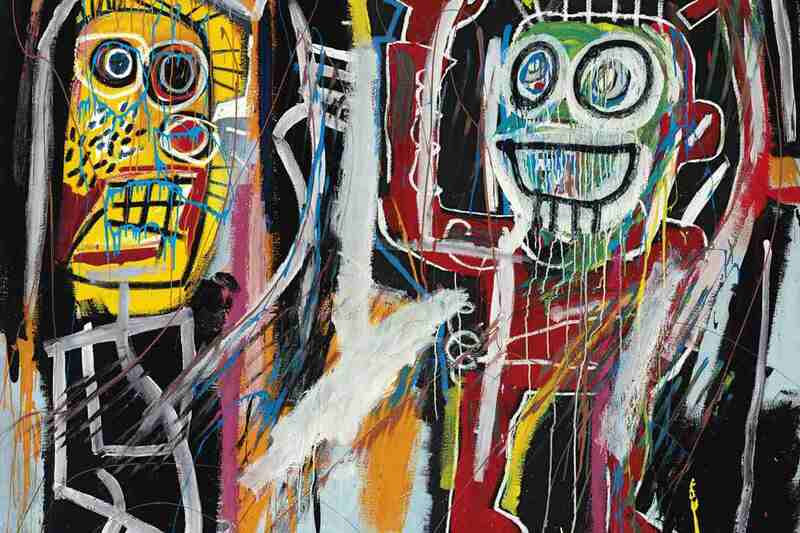 Dustheads has perhaps become the most iconic piece of Basquiat art after selling at auction in 2013 for nearly $49million to a Malaysian financier. The fantastic piece is very dark in nature, featuring two figures that almost look as if they are wearing African masks, a gestural and lively painting that is actually rooted in the use of drugs. Dustheads is thought to be a painting of two people high on PCP, otherwise known as Angel Dust and something Jean-Michel Basquiat probably got involved with as a drug user. Obnoxious Liberals shows Basquiat art at its most political, painted as a direct challenge to the world of rich art collectors that Basquiat had become immersed in. 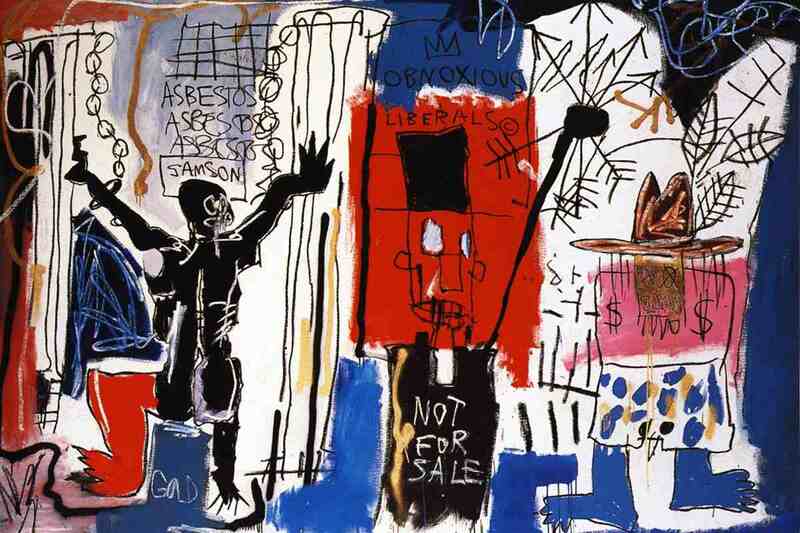 The rich social scene made Jean-Michel Basquiat very uncomfortable and it surfaced in images such as Obnoxious Liberals, with dollar signs and Not for Sale slogans appearing, along with the cowboy hat representing capitalism and exploitation. The figure on the left is Samson and his positioning is also a representation of the exploitation of African people. 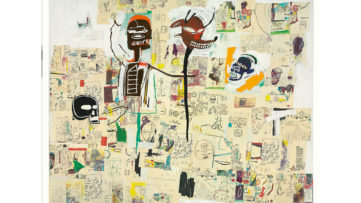 Philistines is another example of Basquiat art that can be seen as an attack on the people that came to surround him, the definition of Philistine being a person who is unreceptive towards culture and the arts, while also having biblical references which were known to appear in the work of Basquiat. Philistines was originally created for a show in 1982 at the Fun Factory, where prices were set deliberately low as a protest against what he considered the exploitation of his work. This incredible piece was sold for just $570 with Jean-Michel Basquiat receiving no money from the sales. Profit I is the perfect example of Basquiat art that combines fine art painting with that of his street art roots, a strong self-portrait with hints of shamanism about it. 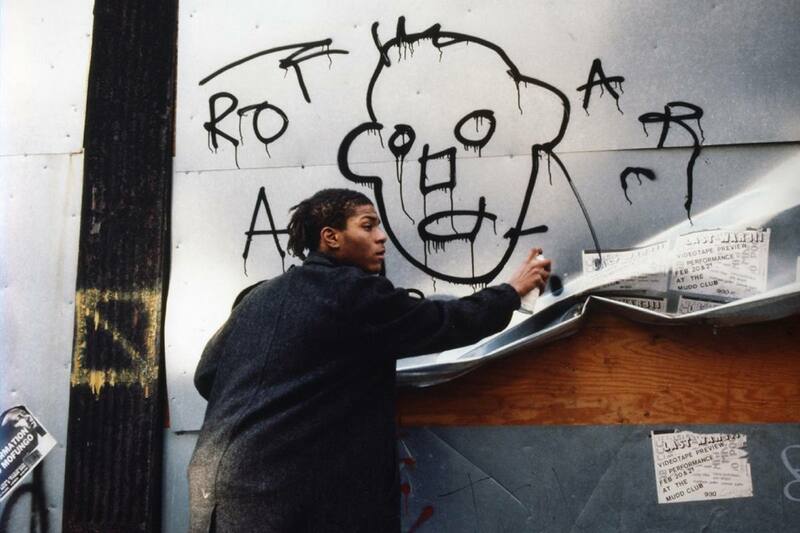 Profit is of course a deliberate play on the word prophet, with Jean-Michel Basquiat often viewed as some kind of prophet of art, while the use of profit indicating his intense dislike of the commercialism that surrounded his art career. The dark painting seems to indicate a tortured soul, the skeletal figure looming out of the darkness. Profit I also shows Basquiat’s understanding of the works of artists such as Willem de Kooning, Franz Kline and Cy Twombly, incorporating their expressionist brushwork. 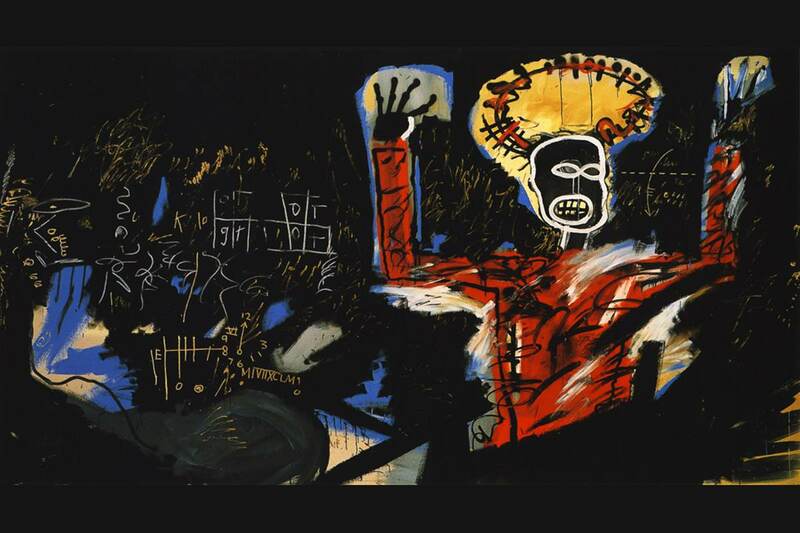 The Nile is one of many pieces of Basquiat art that explore his cultural heritage and this particular painting is full of symbolic imagery that relates to the slave trade. 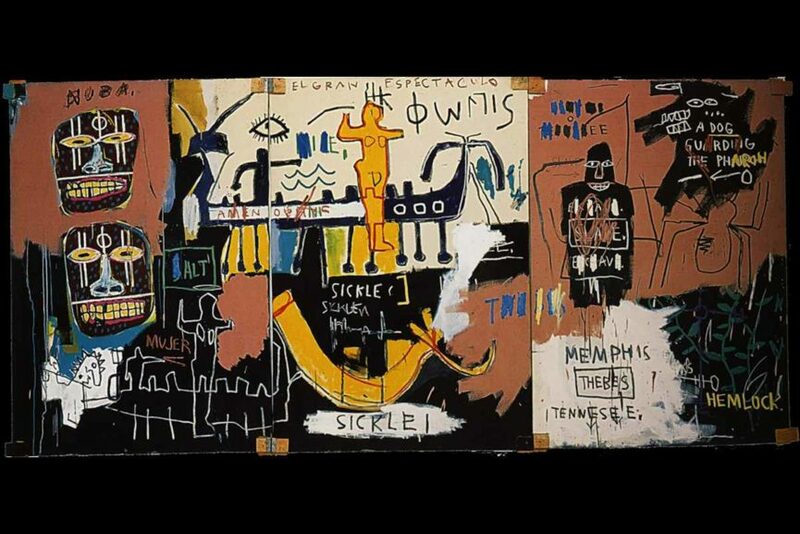 The word sickle appears below the slave ship representing the pillaging of the African people, while Memphis and Thebes are mentioned as they were important cities in ancient Egypt, but Jean-Michel Basquiat links it with modern day Memphis Tennessee and the use of slaves. 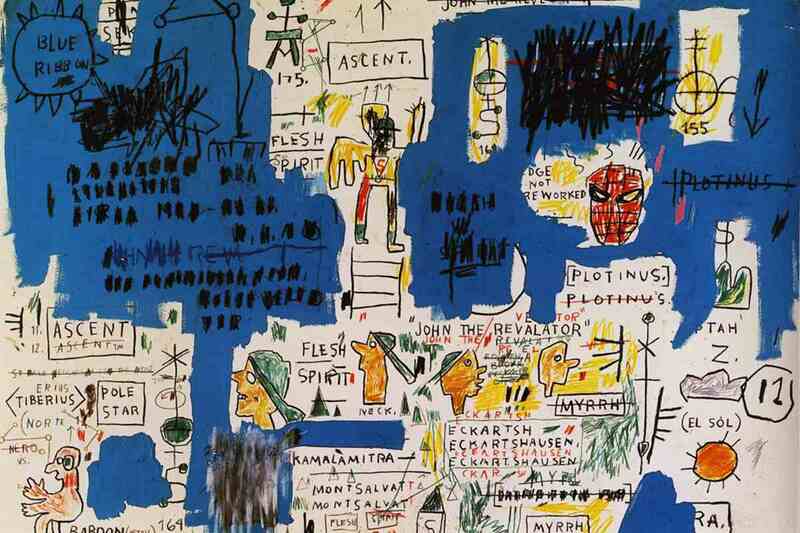 The Nile shows how, in some Basquiat art, everything has a meaning within the work, like some kind of code to decipher much like the hieroglyphics present in the painting. The friendship between Jean-Michel Basquiat and Andy Warhol is legendary and of course, resulted in the pair collaborating, more of which you can read about in Warhol and Basquiat: Play It Again Sam. The pair produced nearly 200 works together during 1984-1985 for the Warhol & Basquiat: Paintings exhibition in New York. The artworks usually involved Warhol starting the works with a silk screen print with Basquiat adding hand painted imagery over the top, occasionally they would swap techniques. 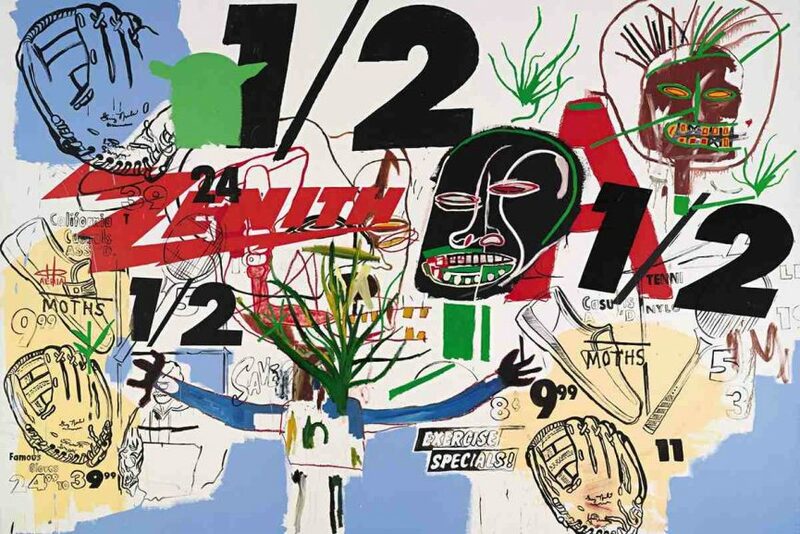 The imagery was very distinctive, combining the graphic style of Warhol with Basquiat art added on top, of which Untitled (Zenith-½) is a perfect example.